The Justice Department is asking for the public’s help in their investigation of the Chicago Police Department. A DOJ community notice asks for anyone with "relevant information regarding the conduct of Chicago Police Department officers" to contact them at 844-401-3735, or community.cpd@usdoj.gov. Meanwhile, Mayor Rahm Emanuel plans to sit down with federal investigators Thursday on the second day of their investigation. He didn’t want to meet with investigators initially, but now says it needs to be done. 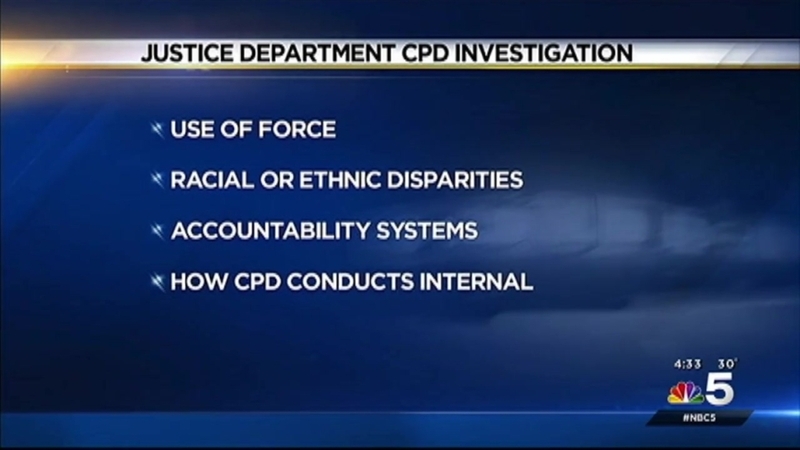 It’s the first time the Department of Justice has set its sights on the CPD, making it the 23rd police unit to be similarly investigated since the beginning of the Obama administration. Mayor Emanuel will meet federal investigators Thursday, on the second day of the Department of Justice's probe into the Chicago Police Department. NBC 5's Emily Florez reports. On Monday, U.S. Attorney Zach Fardon left CPD after the first day of the federal probe. The investigation will be focusing on use of force and accountability within the department. Investigators say they will look into how force is handled and investigated, how police officers are held accountable for their actions, and whether or not there are racial or ethnic disparities found in police use of force. There is no time limit to how long the federal investigation will last. One reason a civil rights investigation can take so long is the vast areas that are put under investigation throughout the course of the probe. After the investigation concludes, a report will be released to the public and from there any reform needed will be mapped out.